Spicy Tuesday – Ancho Chile Powder! Chili Powder is actually a healthy seasoning with significant amounts of beneficial nutrients. To start, it has Vitamin A, Vitamin C, potassium, phosphorus, and a small amount of calcium. You get the most “bang for your buck” when you add one tablespoon of chili powder to your food throughout the day. Research shows that capsaicin, found in chili peppers/powders, has an anti-inflammatory effect, which may help ease arthritic swelling and pain. So how fun is it to add chile to a dessert? 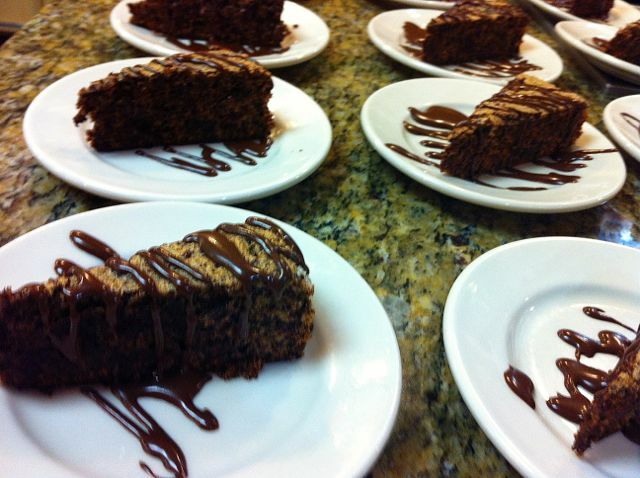 We believe you can have chocolate cake! Just not any old chocolate cake, though… This cake has very little sugar in it, lots of antioxidant deep dark chocolate, nuts and just the right amount of chile powder! The recipe makes a single layer 9” springform pan – yielding 16 slices of chocolaty goodness. Just the right size to enjoy every once in a while! Step One Preheat the oven to 350F. Coat a 10” springform pan with nonstick spray. Cut a circle of parchment and spray. Sprinkle the sugar over the bottom and sides of the pan, shaking out any excess. Step Two Combine the ¾ cup sugar and pecans in a food processor and grind until very fine. Transfer to a bowl and add the chocolate, vanilla, chile, and cinnamon and egg yolks. Stir until blended. Step Three Whip the egg whites in the bowl of a standing mixer until stiff peaks form. Whisk together the cocoa powder, cinnamon and chile powder in a bowl. In a standing mixer fitted with a paddle, beat the butter until creamy. Add the cocoa mixture and powdered sugar alternately with milk. Beat to spreading consistency adding more milk if needed. Blend in the vanilla.